It's real, and it's fascinating to watch. No computers, no A/V equipment. * Just paper, markers, chalk, and Martha paying attention to everything that happens. People love it because it's not canned, it's not perfect, it's happening in the moment, and it's theirs. Graphic Recording captures conversations in text and images. It generally happens live, on large sheets of 4-ft by 8-ft paper big enough for everyone to see. While the meeting is in progress, Graphic Recorder Martha McGinnis listens carefully to what's said and uses her expert judgment as she chooses what to record. The result is an illustrated executive summary that people will actually look at later. Unlike minutes and slide decks, the colorful murals draw your attention in -- into the content, into the meaning, into the emotion. The result is deeper impact and longer retention. Whether it happens in the meeting room or it's virtual, the graphic record helps keep your meeting alive. 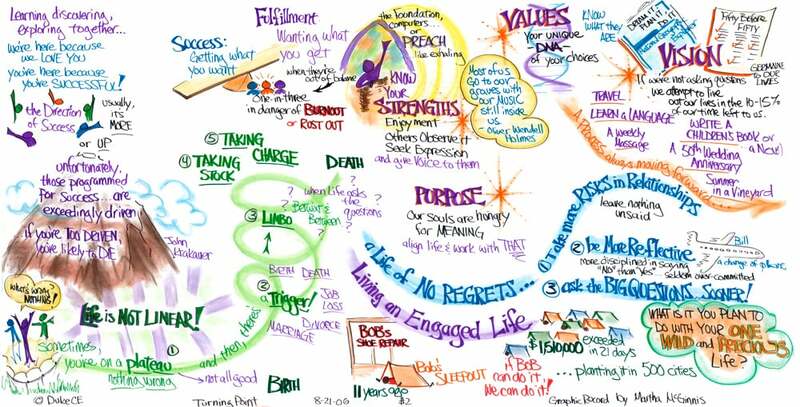 The chart pictured above was created for author Lynne Twist during a live presentation on the material in her book, The Soul of Money. This chart is a great example of a Conference Keynote graphic recording, and it reflects Martha's knack for capturing what is said in both words and images. When she captures discussions, participants often stop by afterward to find their own words illustrated for everyone to see. People love to see their own ideas become part of something big and bold! This particular chart prompted grown men who had not attended the session to tear up while looking at it later. Two of them approached Martha after the conference to say how much it impacted them. It's this deep connection that makes graphic recording work the heart of what she does. Whether Martha and her chart are placed front and center, or off to the side, Live Graphic Recording will transform your meeting. Any size group is OK, and a variety of meeting formats can be accommodated. *Your meeting is virtual? That works too: Martha can share her charts with participants while she records their online or phone conversation. Graphic Recording is More Effective than Audio & Video Recordings and Flip Charts. One 4ft by 8ft wall chart will capture approximately an hour of agenda time. Amazingly, it can be reviewed later in print or onscreen in as little as three minutes. Use the full-size murals or smaller reprints to jumpstart your next meeting or tell your story to others. It's all there: key issues and elements, the ah-ha moments, emerging consensus, metaphors and stories, powerful emotions, decisions, action plans, and questions and answers. And it stays there. Post the charts around the room and people can see everything they've done so far. No need to say something twice, no need to cover old ground--they know they've been heard. Next steps are easier to take when you can see where you've been and where you're headed. With Visual Logic's Graphic Recording service, you'll grab participants and hold their attention long after they've returned to the real world. After the wall charts are reduced to digital files, preparing minutes and reports is a breeze--just add a few details around each image. Not only will you have a complete record of everything important that transpired, people will actually want to read it-- often more than once! Visual Logic can also prepare your meeting record for you-- a colorful Album in Print, PowerPoint, or both, can be designed to suit your communication needs-- from buttoned-down professional to just plain fun. Whether you call it Doodling, a SketchNoting, or Graphic Recording, the effect is always memorable, powerful, and engaging. The mood and level of interaction are transformed when someone actually listens. Sometimes, people don't "get it" until they look at the chart later and see someone else's comment and how it fits into the whole. All too often, individuals are listening through their own agenda and experience. With Live Graphic Recording, Martha listens and records on behalf of everyone present. It's a beautiful, meaningful thing that lights up what might otherwise be corporate humdrum.